You Are Here: Home → How to build an airbrush makeup kit? How to build an airbrush makeup kit? Review of: How to build an airbrush makeup kit? A simple guide on how to make an airbrush makeup kit. Airbrush makeup has become available to everyone, not just celebrities. Due to its many benefits, it is a growing trend nowadays. Who wouldn’t want a makeup kit where there is just one tool that does it all (no brushes, no sponges). Not to mention a quick flawless finish, which it provides, as well as the longer lasting that is crucial for every woman. On the current market there is a wide choice of airbrush makeup kits available, starting from the price of around 90$ and going up. Some of you want to spend less and still look fabulous, while other just love Do-It-Yourself projects. This article will present how to build an airbrush makeup kit. This is the most essential part, because without a gun you cannot do the job. There are two options when it comes to airbrush guns; you can choose a single action or a dual action airbrush gun. You wonder: what’s the difference? Single action guns work with three basics steps: The trigger – press it do release the air; the dial – controls the amount of makeup released; the movement – move the gun closer of further away from the face, this way you control the thickness of the applied makeup. Dual action gun have all the characteristics like a single action ones, with one small difference: you do not use a dial, instead you pull back on the trigger in order to control the quantity of makeup released. Also you can build your own airbrush gun. Check it out in the video below. Your airbrush gun won’t work unless you have a compressor which provides the air. In the world of airbrush compressors, you are offered a choice between a compressor with different pressure settings or a compressor with a continuous pressure setting. For beginner, a continuous air pressure is the best option and the easier one to control. This is also the cheaper option when it comes to compressors. Diagram compressor is less powerful than an industrial compressor and also cheaper, therefore ideal for makeup. For standard makeup application, you will need the power of 30-40 PSI. For body art you will need a higher power. If you plan to carry it, look for ones that are small and not to heavy. 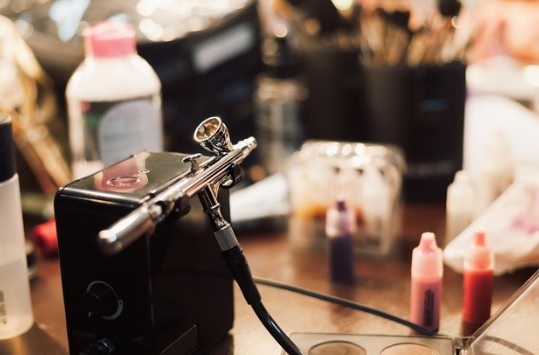 There are three types of airbrush makeup: alcohol based, silicone based and water based. All of them have their benefits, so let’s check them out. NOTE: Use a lighter shade than normal (it sets dark). Check out a video on how to make your on airbrush makeup. The role of the cleaner is to ensure that your makeup kit lasts longer and works like a charm. After each use, take the time and clean the airbrush gun with a cleaning kit. You don’t have to buy one, here is a useful video on how to make an airbrush cleaner with things that you probably already have in your house.